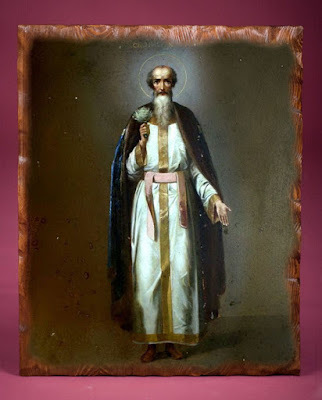 Blessed Nicholas Kochanov, the Fool for Christ of Novgorod, was born in Novgorod into a rich and illustrious family, and his parents were named Maxim and Juliana. From his youthful years he loved piety, he went to church faithfully, and he loved fasting, prayer and almsgiving. Seeing his virtuous life, people began to praise him. Nicholas, disdaining glory from men, began the difficult exploit of folly for the Lord’s sake. He ran about the city in the bitter cold dressed in rags, enduring beatings, insults and mockery, which caused him to rejoice. Blessed Nicholas and another Novgorod fool, Blessed Theodore (Jan. 19), pretended to be irreconcilable foes, and graphically demonstrated to the people of Novgorod the pernicious character of their internecine strife. 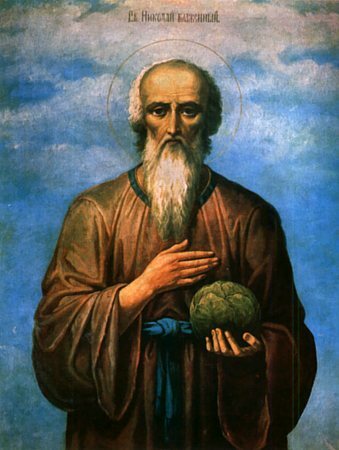 Once, having overcome his sham opponent, Nicholas, who lived on the Sofia side of Novgorod, went along the Volkhov as if on dry land, and threw a head of cabbage at Theodore, who lived on the Trade side, therefore he was called “Kochanov” (“Cabbage-Head”). The Lord glorified Nicholas with the gift of miracles and clairvoyance. Once, after being turned away by servants from a feast to which he had been invited, he left. Immediately, the wine disappeared from the barrel. Only upon the return of the fool, and through his prayer, did it reappear again. When he died on 27 July 1392, Blessed Nicholas was buried at the end of the cemetery by the Yakovlev Cathedral. The relics of Blessed Nicholas rest under a crypt in the Church of the Great Martyr Panteleimon which was built over his grave in 1554. In 1815, over the relics of Blessed Nicholas, a new carved tomb with a canopy was built. 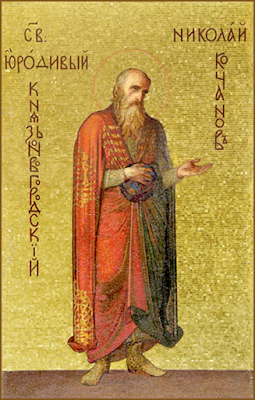 Blessed Nicholas, unlike other holy fools for Christ's sake, is not depicted barefoot, half-naked, or barely covered with old clothes, but often with a princely azure belted coat, holding a cabbage in his hands.